Hi everyone! 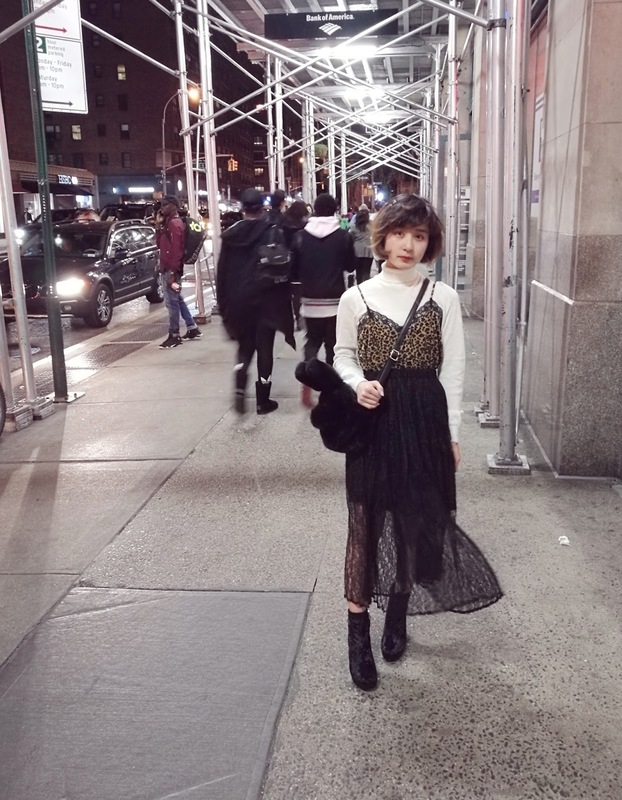 This is long overdue, but I'm going to be talking about my absolute favourite outfits featured in LARME 024! In my last entry I wrote that I pretty much want every outfit in the issue - but these are my Top 9! I was going to originally make a Top 10 but I realized that one of the shots, I was more in love with the hair/hat, so I'm going to be doing a second entry soon about my favourite hairstyles/accessories in the magazine! I sort of skimmed over looking at this shoot in detail at first because it seemed pretty typical - but when I actually slowed down and took a look at the outfits, I fell in love. Yes, it uses many of the same elements as a typical LARME look but the silhouettes are subtle, graceful, and again, structured and cute, all at the same time. There's a sense of balance and harmony with each of these outfits, and there's not one thing overpowering another. 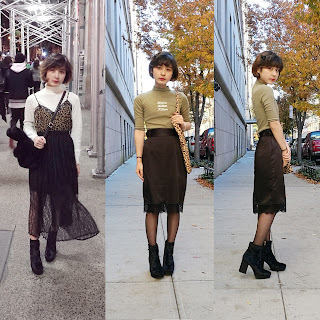 I really enjoy the satin skirt featured in the first outfit and I think the straight hem really compliments the boatneck, almost off-shoulder line of the sweater. I also very much appreciate that hat, and the amount of leg, haha. The second outfit is just adorable. I'm not sure I could truly pull that hat off in public, but the whole thing is just very cute, very girly, but still classy. The last outfit is definitely another cute look, but the leopard crop top gives it a little mature edge. The Urban Goth editorial is something that remains fascinating to me. While I actually don't really LIKE the majority of its individual outfits, the concept really resonates with me and encourages me to be creative within the look's boundaries. This one is my favourite outfit from the whole shoot. I love the leather slip, I would give an arm for it (maybe a third arm if I had one), and I think the fishnets go perfectly with her messy hair. I am not too keen on the boots as I feel they are a little tacky, but black boots were definitely the way to go. The above two are outfits that I thought were just so wearable. I could definitely see myself wearing these to so many places/events/occasions as they seem to me the LARME equivalent of versatility. The first outfit is just incredible. That dress, I've never seen anything like it, and the material looks really thick and good quality. It also looks like a loose fit so seems like a good choice for a dinner date LOL. I also appreciate the soft and dusky palette. The second outfit is just so easy. A graphic tee, a leather skirt, black boots and a choker and bam, you're good to go. But it's still very unique and stands out, as the skirt is just gorgeous with the ruffles and the choker is a thick bow. Another super-wearable outfit! Not a fan of the grandmother purse mostly because I don't think I could pull it off, but I'm sure others could. 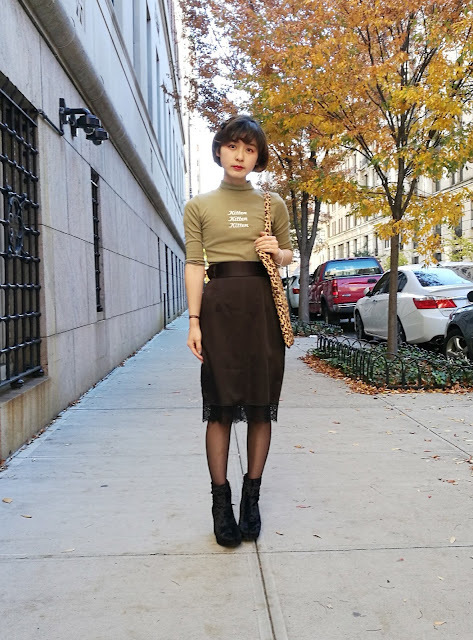 Perfect boots and ultra-comfortable sweater dress - and that style is really common now in Western stores so it'd be fun and easy to replicate! Also can I just say that the lip colour with that shade of beige clothing looks dreamy af? Last but not least, the Burberry-esque dress! At first I wasn't sure, but I couldn't stop looking at it, and now I really want one, lmao. I think I was mostly unsure because the fit looks a little awkward but the print alongside the red heels and white fishnet socks looks amazing. My favourite thing about this outfit though is definitely the footwear. Those socks are perfect. I've spent forever looking for ones with wide fishnets and a wide top, but can't find any T_T. And they look perfect with the bold and mature red of the simple, pointed heels! The end! I hope you enjoyed my favourite outfits! Stay tuned for more LARME 024 goodness!